As on all Southern Crossings tours, you´re taken care of from beginning to end – airport transfers and domestic flights are included! Depart any day and customize your culinary Peru tour at no extra charge! Discounts for groups of 4 or more. This eight-day culinary Peru tour takes us to Lima the gastronomic capital of the Americas to dine at award winning restaurants and learn to cook mouth-watering Peruvian cuisine. Later set off to colonial Cuzco for a cooking class to discover the great tastes of the unique Cusqueñan cuisine. The trip is rounded off with a visit to world famous Incan archeological site of Machu Picchu. We’ll have a chance to experience Peruvian national cuisine in both Lima and Cusco, through participating in cooking classes, market city tours and restaurant kitchen tours. This tour is for those who share a love of all things culinary and wish to combine their culinary interests with a visit to one of the New Seven Wonders of the World, Machu Picchu. This culinary Peru tour is a great way to learn about the variety of culinary influences in Peruvian food and how they came about through others utilizing what was available locally. You will learn about ceviche, aphrodisiac, 100% grass fed products, Latin/Asian Fusion, Peruvian and more! Day 2: Market and Culinary Peru City Tour in Lima. Day 3-4: Culinary Peru tour and Cooking Classes and Dinner in Lima. Day 5: Flight to Cusco and City Tour. Day 6: Culinary Peru tour class in Cusco. Arrive in Lima anytime today and private transfer to your hotel in Miraflores with good artisan markets and restaurants. If arriving during the day, you will have time to explore the capital and get orientated before your culinary peru tour adventure begins. Start off the morning with a guided city tour of Lima. The city tour lets you explore the wonders of the colonial capital, you visit the famous Plaza de Armas, as well as the impressive Cathedral in the Plaza and the beautiful San Francisco church. You also get a chance to take in some beautiful views of the coast at Parque de Amor. Then we head to our first restaurant to be introduced to the gastronomy of Peru. Lima is billed as the cuisine capital of Latin America, and with a wide variety of dishes and incredible blend of spices it doesn’t disappoint. We will then have lunch in Luchita restaurant with the guide who will explain about the different variety of dishes available on the menu. We start today’s culinary Peru tour experience with a visit to a local market, Mercado San Isidro, where we will talk with our favorite vendors about the amazing variety of seasonal local ingredients and get expert advice on what ingredients to purchase for our class. Then we will head to our chef’s apartment in Barranco, a district known for its bohemian character and is home to famous Peruvian writers of the 20th century. Our hands-on class begins with an introduction to local plates and tapas. In our class, our chef will teach you specific and essential techniques used in Peruvian cooking and show you how to utilize the local ingredients to create mouth-watering Peruvian dishes. We will learn to prepare 4 different plates. We will start our gourmet feast, tasting the delicious food we have prepared for lunch or dinner and enjoy the beautiful view of Lima’s coast. Continue the incredible journey of discovery and learn to perfect your cooking skills in another culinary Peru class at Caplina restaurant. Work with the best ingredients under the supervision of top chefs to master the sophisticated blend of spices and ingredientes that makes Peruvian food so mouth-wateringly good! Today after making our purchases at the market we will prepare ceviche, lomo saltado, causa and pisco sour. Round off the trip in Lima with an evening meal in a top restaurant such as Brujas de Cachiche. A short morning flight brings us to the famous Inca city of Cusco. After checking into your hotel, we set out to explore the incredible capital of the Inca Empire. We head to the picturesque Plaza de Armas to the cathedral to see the colonial influence in the city, and we can admire the stunning architecture of the church and also the native influences subtly woven in into the artwork. Onwards to Qoricancha church, where the colonial and Incan architectures are on display side-by-side directly contrasted with each other. Afterwards we make our way above the city to the imposing fortress of Sacsaywaman where we can marvel at the incredible stonework and architecture of the Inca civilization. We head back to Cusco in the late afternoon. 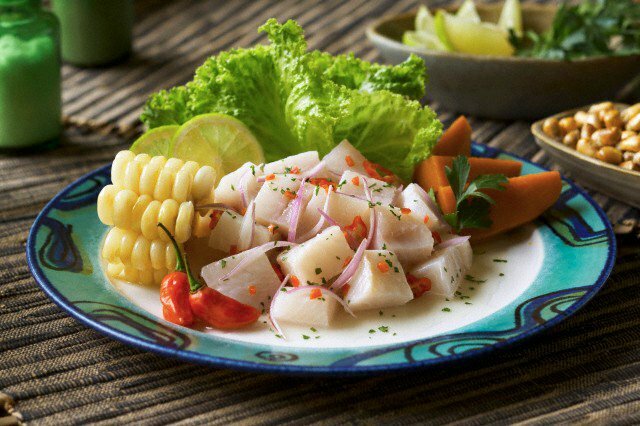 Continue the exploration of the fantastic gastronomy of Peru, in the form of the very different but equally delicious Cusqueñan cuisine. You will head to a local market in the center of Cusco to try different produce. After that set out for a cooking class to discover the sizzling and unique tastes of the Cusco region. A beautiful early morning train journey across the high plain above Cusco then down the Urubamba Valley to majestic Machu Picchu. Known as one of the greatest architectural achievements in the world, this historic sanctuary is considered one of the seven manmade wonders of the world. After a guided tour, take time to independently explore this magnificent site. Return by train and car to Cusco in the evening. Departure day. Morning flight to Lima. International flights may depart any time after 3pm. Please let us know if you would like additional accommodation or guide services at the end of your tour. This culinary Peru tour is an eight day tour which includes three cooking classes and walking around ruins and during city tours. As always, a certain patience is required for the inconsistencies and occasional delays of developing-world travel. International flight to/from Lima, pre- & post- tour accommodation, visas, vaccinations, personal insurance, meals except where specified above, drinks, laundry, souvenirs or tips. Medical travel insurance is not included through Southern Crossings, cancellation insurance is advisable. If time permits we recommend an extra night at Machu Picchu and/or an extra night to include a day peru culinary tour to the South of Cusco to try Ginnea pig, Chicharron and Duck. Machu Picchu: similar to Cusco but a bit warmer and with more chance of rain.